The ultra-thin Spike Wallet is the perfect companion for iPhone Apple Pay users and others looking for a minimalist way to carry the bare wallet necessities. 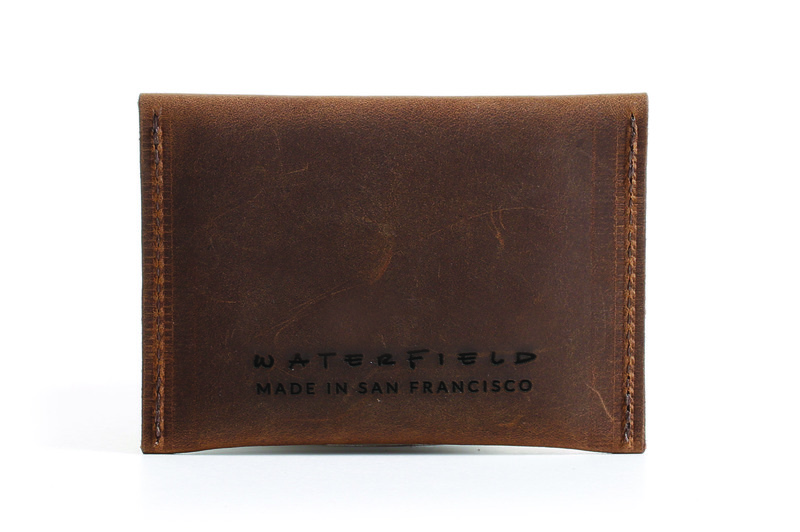 The premium leather, Made in America wallet is available now from the WaterField Designs online store. 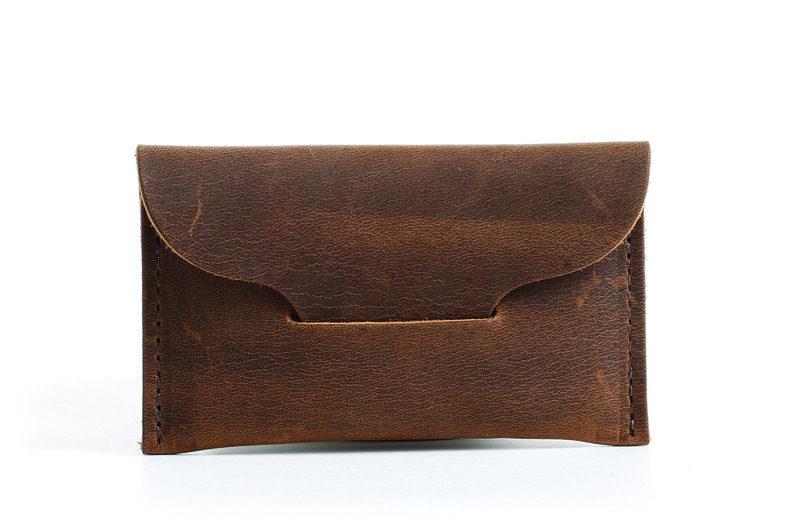 Now with Apple Pay gaining ground, we’ve designed this new Spike, our most minimal [wallet] yet. As Apple Pay and Android Pay (May 2015) gain popularity, and loyalty cards and receipts can be accessed from smartphones, it may be time to downsize the typical wallet. San Francisco’s WaterField Designs introduces the leather Spike Wallet—an ultra-minimalist, all-leather case ideal for carrying the remaining bare essentials: driver’s license, transit card and a few bills. The super-thin Spike fits easily into a front pocket in a “barely there” fashion, and its grizzly distressed leather develops a beautiful patina with use. The Spike is available in two sizes—one for essential cards and one for cards plus cash (and even a house key). 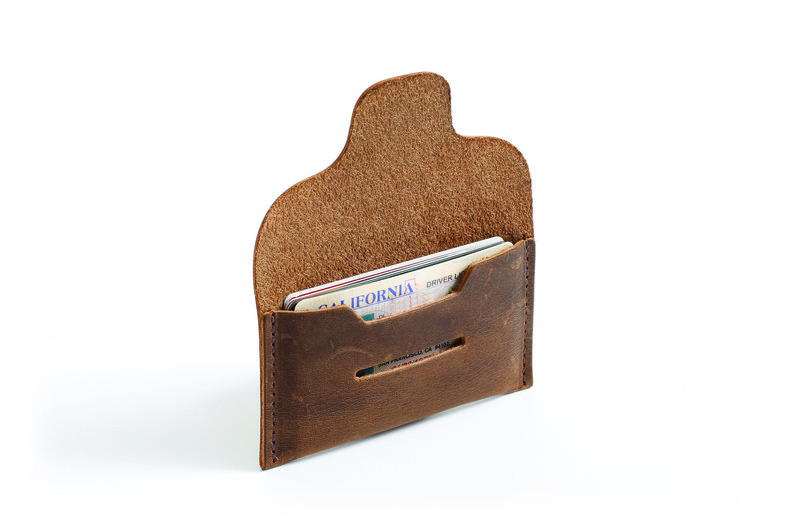 Each is laser cut and solidly stitched for durability. The Spike’s grizzly, distressed, full-grain leather is culled from the most durable top layer of the hide, where the grain is tightest and most water-resistant. 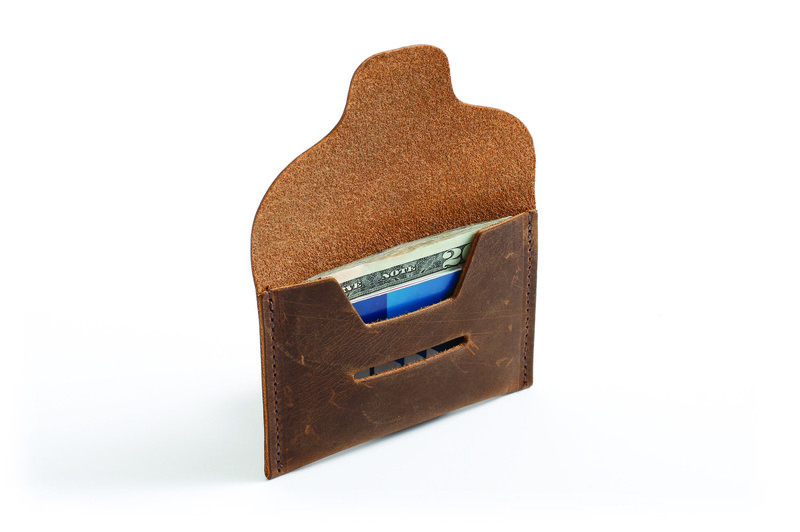 Shaped like a mini envelope, the Spike’s cover closes by inserting its tip into a cut out slot on the front of the case. In addition to the new Spike Wallet, WaterField Designs makes custom laptop sleeves, bags and cases for all types of digital gear. The company’s commitment to manufacturing in San Francisco, its dedication to quality, and its unusual devotion to kind and thorough customer service, has resulted in a loyal customer following for the past fifteen years. Sizes: Business card—4.3 x 2.5 inches. 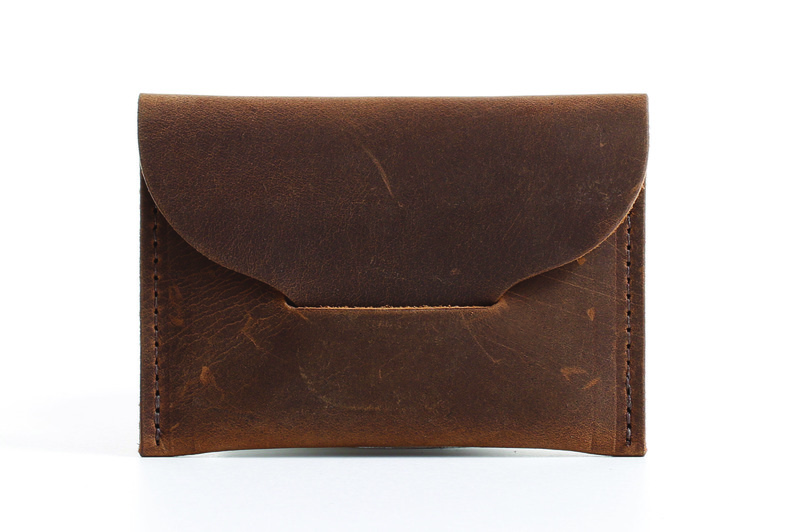 Wallet—4.3 x 3 inches. Colors: Grizzly brown, naturally-tanned, distressed, full-grain leather. 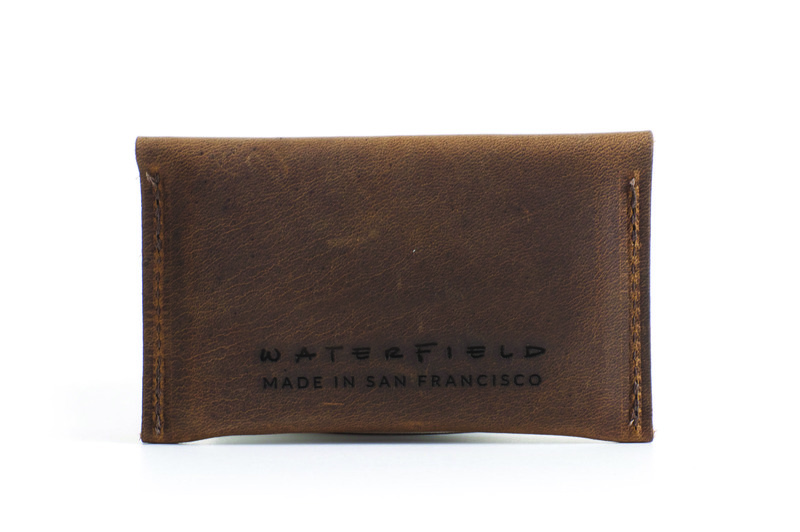 Shipping now from the WaterField Designs online store. WaterField Designs manufactures custom-fitted, high-quality cases and bags for a full-range of laptop computers, tablets, smartphones, and other digital gear. All products are manufactured to exacting standards entirely in San Francisco, in the heart of the city’s Maker District. More company information is available at “Our Story”. 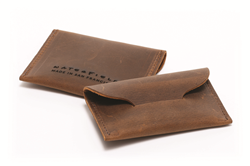 WaterField Designs and Spike wallet are trademarks of WaterField Designs. Other company and product names may be trademarks of their respective owners. Copyright ©2015. All Rights Reserved.